For the JR East line connecting Hachiōji with Takasaki, see Hachikō Line. Waiting perseveringly for the return of his deceased owner for more than nine years till his death. Hachikō was born on November 10, 1923, at a farm near the city of Ōdate, Akita Prefecture. In 1924, Hidesaburō Ueno, a professor at the Tokyo Imperial University, brought him to live in Shibuya, Tokyo, as his pet. Hachikō would meet Ueno at Shibuya Station every day after his commute home. This continued until May 21, 1925, when Ueno died of a cerebral hemorrhage while at work. From then until his death on March 8, 1935, Hachikō would return to Shibuya Station every day to await Ueno's return. During his lifetime, the dog was held up in Japanese culture as an example of loyalty and fidelity. Well after his death, he continues to be remembered in worldwide popular culture, with statues, movies, books, and appearances in various media. Hachikō is known in Japanese as chūken Hachikō (忠犬ハチ公) "faithful dog Hachikō", hachi meaning "eight" and the suffix -kō indicating affection. Shibuya Station as it was in the Taishō and Pre-war Shōwa eras (1912–1945). Hachiko, a golden brown Akita, was born on November 10, 1923 at a farm located in Ōdate, Akita Prefecture, Japan. In 1924, Hidesaburō Ueno, a professor in the agriculture department at the Tokyo Imperial University, took Hachikō as a pet and brought him to live in Shibuya, Tokyo. Ueno would commute daily to work, and Hachikō would leave the house to greet him at the end of each day at the nearby Shibuya Station. The pair continued the daily routine until May 21, 1925, when Ueno did not return. The professor had suffered a cerebral hemorrhage, while he was giving a lecture, and died without ever returning to the train station in which Hachikō waited. Each day, for the next nine years, nine months and fifteen days, Hachikō awaited Ueno's return, appearing precisely when the train was due at the station. Hachikō attracted the attention of other commuters. Many of the people who frequented the Shibuya train station had seen Hachikō and Professor Ueno together each day. Initial reactions from the people, especially from those working at the station, were not necessarily friendly. However, after the first appearance of the article about him in Asahi Shimbun on October 4, 1932, people started to bring Hachikō treats and food to nourish him during his wait. One of Ueno's students, Hirokichi Saito, who developed expertise on the Akita breed, saw the dog at the station and followed him to the Kobayashi home, the home of Ueno's former gardener, Kuzaboro Kobayashi, where he learned the history of Hachikō's life. Shortly after the meeting, the former student published a documented census of Akitas in Japan. His research found only 30 purebred Akitas remaining, including Hachikō from Shibuya Station. He returned frequently to visit Hachikō, and over the years he published several articles about the dog's remarkable loyalty. In 1932, one of his articles, published in Asahi Shimbun, placed the dog in the national spotlight. Last known photo of Hachikō - pictured with his owner's partner Yaeko Ueno (front row, second from right) and station staff in mourning in Tokyo on March 8, 1935. Hachikō became a national sensation. His faithfulness to his master's memory impressed the people of Japan as a spirit of family loyalty to which all should strive to achieve. Teachers and parents used Hachikō's vigil as an example for children to follow. A well-known Japanese artist rendered a sculpture of the dog, and throughout the country, a new awareness of the Akita breed grew. Eventually, Hachikō's legendary faithfulness became a national symbol of loyalty, particularly to the person and institution of Emperors. Hachikō died on March 8, 1935 at the age of 11. He was found on a street in Shibuya. In March 2011, scientists finally settled the cause of death of Hachikō: the dog had both terminal cancer and a filaria infection. There were also four yakitori skewers in Hachikō's stomach, but the skewers did not damage his stomach nor cause his death. Hachikō's grave beside Professor Ueno's grave in Aoyama Cemetery, Minato, Tokyo. After his death, Hachikō's remains were cremated and his ashes were buried in Aoyama Cemetery, Minato, Tokyo where they rest beside those of Hachikō's beloved master, Professor Ueno. Hachikō's fur, which was preserved after his death, was stuffed and mounted and is currently on permanent display at the National Science Museum of Japan in Ueno, Tokyo. The Hachikō Statue at Shibuya Station in Tokyo is a popular meeting place. In April 1934, a bronze statue based in his likeness sculpted by Teru Ando was erected at Shibuya Station (35°39′32.6″N 139°42′2.1″E﻿ / ﻿35.659056°N 139.700583°E﻿ / 35.659056; 139.700583), and Hachikō himself was present at its unveiling. The statue was recycled for the war effort during World War II. In 1948, the Society for Recreating the Hachikō Statue commissioned Takeshi Ando, son of the original artist, to make a second statue. When the new statue appeared, a dedication ceremony occurred. The new statue, which was erected in August 1948, still stands and is a popular meeting spot. The station entrance near this statue is named "Hachikō-guchi", meaning "The Hachikō Entrance/Exit", and is one of Shibuya Station's five exits. The Japan Times played an April Fools' joke on readers by reporting that the bronze statue was stolen a little before 2:00 AM on April 1, 2007, by "suspected metal thieves". The false story told a very detailed account of an elaborate theft by men wearing khaki workers' uniforms who secured the area with orange safety cones and obscured the theft with blue vinyl tarps. The "crime" was allegedly recorded on security cameras. A similar statue stands in Hachikō's hometown, in front of Ōdate Station. In 2004, a new statue of Hachikō was erected in front of the Akita Dog Museum [ja] in Odate, Japan. After the release of the American movie Hachi: A Dog's Tale (2009) filmed in Woonsocket, Rhode Island, the Japanese Consulate in the United States helped the Blackstone Valley Tourism Council and the city of Woonsocket to unveil an identical statue of Hachikō at the Woonsocket Depot Square, which was the location of the "Bedridge" train station featured in the movie. On March 9, 2015, the Faculty of Agriculture of the University of Tokyo unveiled a bronze statue depicting Ueno returning to meet Hachikō at the University of Tokyo, Japan to commemorate the 80th anniversary of Hachikō's death. The statue was sculpted by Tsutomo Ueda from Nagoya and depicts a very excited Hachikō jumping up to greet his master at the end of a workday. Ueno is dressed in a hat, suit, and trench coat, with his briefcase placed on the ground. Hachikō wears a studded harness as seen in his last photos. Each year on March 8, Hachikō's devotion is honored with a solemn ceremony of remembrance at Tokyo's Shibuya railroad station. Hundreds of dog lovers often turn out to honor his memory and loyalty. In 1994, Nippon Cultural Broadcasting in Japan was able to lift a recording of Hachikō barking from an old record that had been broken into several pieces. A huge advertising campaign ensued and on Saturday, May 28, 1994, 59 years after his death, millions of radio listeners tuned in to hear Hachikō bark. 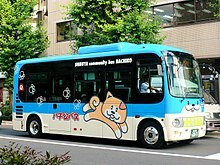 In 2003, Shibuya ward started new minibus (officially called "community bus") routes in the ward, and nicknamed them "Hachiko-bus". Now there are four different routes. In July 2012, rare photos from Hachikō's life were shown at the Shibuya Folk and Literary Shirane Memorial Museum in Shibuya ward as part of the "Shin Shuzo Shiryoten" (Exhibition of newly stored materials). In November 2015, a previously undiscovered photograph of Hachikō was published for the first time. The image, which was captured in 1934 by a Tokyo bank employee, shows the dog relaxing in front of Shibuya Station. Yaeko Sakano (坂野 八重子, Sakano Yaeko), more often referred as Yaeko Ueno, was an unmarried partner to Hidesaburō Ueno for about 10 years until his death in 1925. Hachikō was reported to have shown great happiness and affection towards her whenever she came to visit him. Yaeko died on 30 April 1961 at the age of 76 and was buried at a temple in Taitō, further away from Ueno's grave, despite her requests to her family members to be buried with her late partner. In 2013, Yaeko's record which indicated that she had wanted to be buried with Ueno was found by Sho Shiozawa, the professor of the University of Tokyo. Shiozawa was also the president of the Japanese Society of Irrigation, Drainage and Rural Engineering, which manages Ueno's grave at Aoyama Cemetery. Later on November 10, 2013, which also marked the 90th anniversary of the Birth of Hachikō, Sho Shiozawa and Keita Matsui, a curator of the Shibuya Folk and Literary Shirane Memorial Museum, felt the need that Yaeko to be buried together with Ueno and Hachikō. The process began with willing consent from the Ueno and Sakano families and the successful negotiations with management of the Aoyama Cemetery. However, due to regulations and bureaucracy, the process took about 2 years. Shiozawa also went on as one of the organizers involved with the erection of bronze statue of Hachikō and Ueno which was unveiled on the grounds of the University of Tokyo on March 9, 2015 to commemorate the 80th anniversary of Hachikō's death. On 19 May 2016 during the ceremony at the Aoyama Cemetery with both Ueno and Sakano families in present, some of the ashes of Yaeko Sakano were buried with Ueno and Hachikō, her name and the date of her death was inscribed on the side of his tombstone, thus fulfilling the reunion of Hachikō's family. "By putting the names of both on their grave, we can show future generations the fact that Hachikō had two keepers," Shiozawa said. "To Hachikō the professor was his father, and Yaeko was his mother," Matsui added. Last moment of Hidesaburō Ueno's partner Yaeko Ueno (front row, second from right) and the station staff in mourning with the deceased Hachikō in Tokyo on March 8, 1935. Hachikō was the subject of the 1987 movie Hachi-kō (Hachiko Monogatari) ハチ公物語 (literally "The Tale of Hachiko"), directed by Seijirō Kōyama, which told the story of his life from his birth up until his death and imagined spiritual reunion with his master. Considered a blockbuster success, the film was the last big hit for Japanese film studio Shochiku Kinema Kenkyû-jo. Hachi: A Dog's Tale, released in August 2009, is an American movie starring actor Richard Gere, directed by Lasse Hallström, about Hachikō and his relationship with an American professor & his family following the same basic story, but a little different, for example Hachiko was a gift to professor Ueno, this part is entirely different in the American version. The movie was filmed in Woonsocket, Rhode Island, primarily in and around the Woonsocket Depot Square area and also featured Joan Allen and Jason Alexander. The role of Hachi was played by three Akitas - Leyla, Chico and Forrest. Mark Harden describes how he and his team trained the three dogs in the book, "Animal Stars: Behind the Scenes with Your Favorite Animal Actors." After the movie was completed, Harden adopted Chico. Hachikō is also the subject of a 2004 children's book entitled Hachikō: The True Story of a Loyal Dog, written by Pamela S. Turner and illustrated by Yan Nascimbene. Another children's book, a short novel for readers of all ages called Hachiko Waits, written by Lesléa Newman and illustrated by Machiyo Kodaira, was published by Henry Holt & Co. in 2004. Hachiko Waits was released in paperback by Square Fish (an imprint of MacMillan) in 2008. Hachikō is featured prominently in the 2008 novel The Story of Edgar Sawtelle by David Wroblewski. Hachikō plays an important part in the 1967 children's book Taka-chan and I: A Dog's Journey to Japan. Based on Hachikō story, a movie in Telugu language was produced with the name 'Tommy'. Tommy is a 2015 Telugu, drama film, produced by Changodi Hari Babu, Bosam Chinna Babu on Babu Pictures banner and directed by Raja Vannem Reddy. This film is adapted from the real story of Hachiko. "Jurassic Bark", episode 7 of season 4 of the animated series Futurama has an extended homage to Hachikō, with Fry discovering the fossilized remains of his dog, Seymour. After Fry was frozen, Seymour is shown to have waited for Fry to return for 12 years outside Panucci's Pizza, where Fry worked, never disobeying his master's last command to wait for him. A play was made by Spare Parts Puppet Theatre in Fremantle, Western Australia, and was dedicated to the story of Hachikō. The 1987 film Hachi-kō (Hachiko Monogatari) ハチ公物語 (literally "The Tale of Hachiko") and the 2009 film Hachi: A Dog's Tale are based on the story of Hachikō. Episode 6 of the anime Time Bokan 24 referenced Hachiko's legacy. In the Japanese manga One Piece, there is a similar story with a dog named Shushu. In the anime Pokémon: Master Quest, there is a similar story about a Ninetales who waited 200 years for her master to return. Persona 5 allows the player to explore Shibuya Station, where they can examine a spoof statue of Hachikō named 'Buchiko'. In the anime, Oreimo 2: episode 5 Kirino Kōsaka relates Kyōsuke Kōsaka, waiting for her to come home to Hatchikō. In the commentary in the Disney/Pixar movie Wall-E, one of the animators mentions that the cockroach waiting in place for the robot to return to earth was a homage to Hachiko. In The World Ends with You, a video game developed by Square Enix and Jupiter Corporation, the Hachikō statue is featured, its legend referenced on several occasions. The location of the statue plays an important role in the narrative. In Scooby-Doo! and the Samurai Sword, the Mystery Inc gang come across Hachiko's statue at Shibuya Station when they visit Tokyo, with their Japanese guide Miyumi telling Hachiko's story to them, inspiring Scooby Doo with the hopes of acquiring his own statue, which comes true at the end of the film. Hachikō was among many dogs famous for their loyalty. Such stories are at least as old as the ancient Greek Homer's story of Argos. Similar to Hachiko's story is that of the Italian dog Fido, the Scottish dog Greyfriars Bobby, Shep from Fort Benton, Montana USA, Red Dog from Pilbara, Western Australia and numerous other dogs famous for remaining faithful after the death of their master. In Japan itself, it was not an unprecedented story. "The case of this dog is one that is rarely heard of in the world, and should be shown to after ages. Let Yorozu's kindred be made to construct a tomb and bury their remains." Stargazing Dog, a manga about an exceptionally loyal pet. ^ "Hachiko: The Akita Who Became a Symbol of Loyalty". Retrieved 25 July 2016. ^ "Unbelievable Facts". Retrieved 1 March 2014. ^ "Hollywood the latest to fall for tale of Hachiko". The Japan Times. Kyodo News. June 25, 2009. Retrieved 25 September 2014. ^ Bouyet, Barbara. Akita, Treasure of Japan, Volume II. Hong Kong: Magnum Publishing, 2002, page 5. ISBN 0-9716146-0-1. Accessed via Google Books April 18, 2010. ^ "Mystery solved in death of legendary Japanese dog". yahoo.com. Archived from the original on 5 March 2011. Retrieved 2 October 2015. ^ "Worms, not skewer, did in Hachiko". The Japan Times. 4 March 2011. ^ Kimura, Tatsuo. "A History Of The Akita Dog". Akita Learning Center. Retrieved May 6, 2011. ^ "Stuffed body of Hachiko (& other notable canines)". pinktentacle.com. 17 August 2009. Retrieved 30 July 2013. ^ Drazen, Patrick (2011). A Gathering of Spirits: Japan's Ghost Story Tradition: from Folklore and Kabuki to Anime and Manga. iUniverse. p. 101. ISBN 1462029426. Aoyama Cemetery contains a memorial to Hachiko on the site of Professor Ueno's grave. Some of Hachiko's bones are reportedly buried there, but in fact, Hachiko can still be seen -- stuffed, in the National Science Museum. ^ Newman, Lesléa. Hachiko Waits. Macmillan, 2004. 91. Retrieved from Google Books on February 25, 2011. ISBN 0-8050-7336-1, ISBN 978-0-8050-7336-2. ^ "METAL THIEVES SUSPECTED: Shibuya's 'loyal dog Hachiko' vanishes overnight". The Japan Times. April 1, 2007. Archived from the original on December 22, 2011. ^ "Hachiko, Japan's most loyal dog, finally reunited with owner in heartwarming new statue in Tokyo". rocketnews24.com. 11 February 2015. Retrieved 2 August 2015. ^ "Hachiko Statue University of Tokyo - Tokyo - Japan Travel - Japan Tourism Guide and Travel Map". JapanTravel. Retrieved 2018-04-09. ^ American Kennel Club (listed author): Complete Dog Book: The Photograph, History, and Official Standard of Every Breed Admitted to AKC Registration, and the Selection, Training, Breeding, Care, and Feeding of Pure-bred Dogs, Howell Book House, 1985, page 269. ISBN 0-87605-463-7. ^ Retrieved 13 November 2018. ^ Ohmoro, Kazuya (2012-06-16). "Shibuya museum showcases last photo of loyal pooch Hachiko". The Asahi Shimbun. Archived from the original on 2012-07-18. ^ The Yomiuri Shimbun (2015-11-05). "Rare photograph shows Hachiko relaxing alone at Shibuya Station". Yomiuri Shimbun. Archived from the original on 2015-11-14. 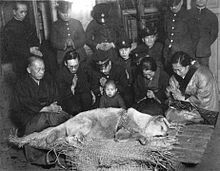 ^ "Remains of Hachiko master's wife reinterred with husband, famously loyal dog". Mainichi Daily News. 2016-05-20. Retrieved 2018-04-10. ^ "In love and death - The Nation". The Nation. Retrieved 2018-04-10. ^ a b Hachikō Monogatari on IMDb . ^ Anne Tereska Ciecko, Contemporary Asian Cinema: Popular Culture in a Global Frame, Berg Publishers, 2006, pages 194–195. ISBN 1-84520-237-6. Accessed via Google Books August 21, 2008. ^ Ganzert, Robin; Anderson, Allen; Anderson, Linda; Becker (Foreword), Marty (Foreword) (September 16, 2014). Animal Stars: Behind the Scenes with Your Favorite Animal Actors (Hardcover) (1st ed.). New World Library. pp. 296 pages. ISBN 1608682633. ISBN 978-1608682638. Retrieved November 20, 2015. ^ The Story of Edgar Sawtelle: Reviews. ^ Lifton, Betty Jean; Hosoe, Eikoh, Taka-chan and I: A Dog's Journey to Japan, The New York Review of Books, 1967. ^ Futurama Live! Post-Show w/ Billy West, Maurice LaMarche, Matt Groening and more!. YouTube. 6 September 2013. Retrieved 2 October 2015. Wikimedia Commons has media related to Hachiko. "Behind the film "Hachi: A Dog's Tale"". Vicki Shigekuni Wong. Retrieved November 29, 2012. Site with numerous photos of the real Hachikō during his life, at the end of his life, of his beloved professor & of people who came to care for Hachikō. Skabelund, Aaron Herald (23 September 2011). "Canine Imperialism". Berfrois. Retrieved 28 October 2011.